The Leptin diet is a program devised by board certified clinical nutritionist Byron J. Richards, the founder of a supplement company called Wellness Resources and an expert on the hormone leptin. Leptin is produced in your fat stores, and its job is to signal your brain when you have taken in enough food. In obese individuals, the leptin gauge malfunctions, leading to leptin “resistance” and overeating. The Leptin diet, then, attempts to help people take charge of their food intake so they can lose weight. The plan is a reduced-carb diet that offers a variety of menu options. Talk to a doctor before launching any diet to make sure it is a good fit for you. On his website, Richards outlines the five rules of his dietary plan. First, he directs you to stop eating after dinner and to finish your final meal of the day at least three hours before going to bed. Second, he says to eat three meals a day, but no snacks. Third, he cautions not to eat large meals and to stop when you are not quite full. The fourth rule is to always eat breakfast. Last, you should reduce the number of carbs you eat, but don’t eliminate them completely. The Leptin diet encourages you to eat fresh, organic foods whenever possible. On this diet, you neither religiously count calories nor totally ignore them. The guidelines encourage you to become familiar with the calorie counts of your favorite foods with an app or an online tool, like the USDA Nutrient Database. Keep your three daily meals within the range of 400 to 600 calories each. The diet also proposes a daily ratio of macronutrients of 40 percent fat, 30 percent protein and 30 percent carbohydrates. You should eat 50 to 75 percent of your ideal body weight in grams of protein per day. If, for example, your ideal body weight is 150 pounds, you consume 75 to 113 grams of protein every day. On the Leptin diet, you should also get 35 to 50 grams of daily fiber, some of which you may have to obtain through supplements. Absolutely no snacking is allowed on the Leptin diet. If you get hungry between meals, Richards recommends drinking unsweetened beverages such as plain tea or coffee, or water with lemon. Better yet, keep yourself busy, away from foods, he says. He also advises steering clear from the following: sodas, including diet brands; foods with artificial sweeteners; soy foods; and energy drinks. Breakfast on the Leptin diet is arguably the most important meal of the day. This meal should include 20 to 30 grams of protein. To fulfill this hefty requirement, you could eat steak and an egg; a scrambled egg has 6 grams of protein, while 3 ounces of top round supplies 20 grams. Or try something lighter like oatmeal with almond milk and whey protein powder. For a breakfast-to-go, whip up one of the approved smoothies, like Lemon Basil, Berry Green or Coco Spice. You concoct these with a mixture of fresh ingredients such as basil leaves, spinach and apple, plus protein powder and a fiber supplement you purchase through the website. Salad is a good lunch choice on the Leptin diet. 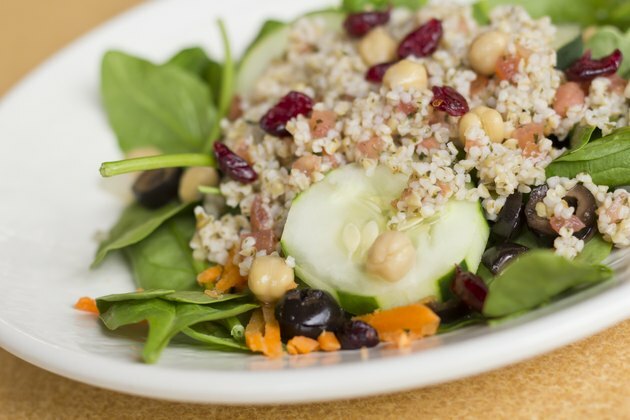 Among the approved recipes on the menu are quinoa and lentil salad, cranberry spinach quinoa salad, crab salad, warm lentil salad and roasted beet and goat cheese salad. Quinoa and lentils are especially smart choices for vegetarians concerned about getting enough protein on the Leptin diet, which leans toward animal-based protein. A cup of cooked quinoa supplies 8 grams of protein, while a cup of cooked lentils offers almost 18 grams. Add a serving of soup to lunch, like tomato borscht or butternut squash, for a more satisfying meal. Chicken, steak, salmon and seafood constitute the major menu options for dinner on the Leptin diet, accompanied by ample non-starchy vegetables. Approved entrees include coconut rice with grilled shrimp, chicken cutlets with cherry salsa, a turkey burger, salmon tacos, lime-grilled fish tacos, steak burritos, and poached salmon with mango salsa. The website lists no vegetarian options, but you could substitute plant-based protein like beans in some of the menus, like the chicken chili, or create bean burgers. If you need something sweet for dessert, try a piece of fresh fruit.